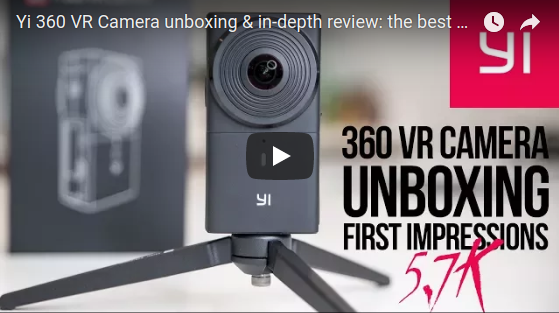 CreatorUp’s Hugh Hou posted an unboxing, tutorial and first impressions on the Yi 360 VR, the most affordable 5.7K 360 camera on the market. The Yi 360 VR (specifications and other info here) was the first consumer 360 camera announced to have 5.7K video resolution. It also has 4K in-camera stitching and 4K live streaming. Perhaps most surprising of all was the price — just $399, lower than some 4K 360 cameras such as the Ricoh Theta V and Kodak Orbit 360. Hugh’s walkthrough video shows that the interface is user friendly and straightforward. As for image quality, Hugh’s first impression is that the video is detailed and has high dynamic range. I actually have a preproduction version of the camera as well. I will be posting my sample videos and hands-on preview of the Yi360VR tomorrow, so be sure to check back here. Update: here it is! For more samples and other information, pls. check out my Yi 360 VR page and I also suggest joining the Yi 360VR group on Facebook. And if you have any questions, please let me know in the comments! +Mic Ty Really looking forward to your review!!!!!!! !